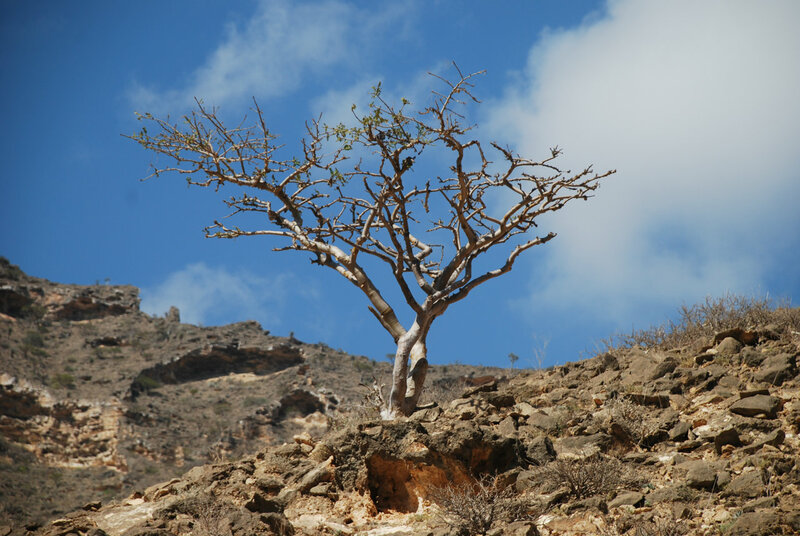 Boswellia does grow in other places....the Thar desert of Rajasthan for example, but we are concerned primarily with Boswellia sacra, as this tree is the one that grows in Dhofar Oman, and in Somaliland/Puntland. Altogether, counting everyone, there are about 25 species of frankincense. Boswellia carterii and Boswellia sacra are the same plant, and sacra is the older name. Therefore, there is no Boswellia carterii in the Arabian Peninsula. It’s all sacra. Boswellia, along with Myrrh (Commiphora,) belongs to the Burseraceae family. Both plants are harvested similar to the way you harvest rubber---making cuts, or scrapes, on the bark, until the tree bleeds sap, and collecting it over a period of weeks, as it slowly oozes out and hardens. The luban trees grow in a variety of micro-climates within Dhofar, and some say they prefer the the drier areas behind the mountains out of the reach of the monsoon rain. But we have wonderful strong and beautiful trees in the wadis which taste the monsoon rains too. And they give excellent resin, dark and soft and gooey and fragrant with a delectable orange-spice shimmer. It’s also known as Black Frankincense. The trees from the areas to the east of Salalah, all the way to Hasik and the mountains behind them, give a beautiful resin known as Howjary--the color of this varies from reds through whites and silvers and even to greens and blues. In Oman “desert” means “sand desert.” So the area between the mountains, and the desert is what we in North America would call “desert.” In Oman this is the Nejd, and the trees that live there give a gum called Nejdi.